Tempered glass panel showcases custom RGB lightingThe H700i showcases NZXT’s vision for modern PC building. 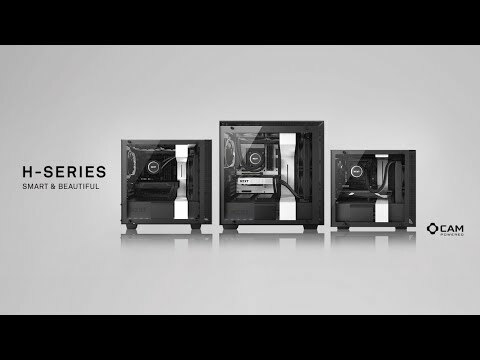 This premium mid-tower case features a unique CAM Powered Smart Device that digitally drives RGB lighting and fan performance. It empowers builders to easily control RGB lighting and fans, while Adaptive Noise Reduction optimizes your build’s acoustics through machine learning and ideal fan settings. Includes four integrated Aer F fans and two RGB LED strips to enhance the aesthetics of your build as seen through the H700i’s stunning tempered glass panel. MANAGE YOUR CABLES LIKE A BOSS Cable management can often take more time than assembly. NZXT have designed a new cable routing kit with pre-installed channels and straps, on the back of the motherboard tray, for intuitive and easy wiring. The signature cable bar has been upgraded to become more adjustable and the right panel is designed with a quick-release switch to enable fast and easy installation of new components and upgrades. The H700 series layout ensures you’ll enjoy building your PC as much as you enjoy gaming on it. QUICK RELEASE TRAYS Storage installation is a snap with three quick-release 2.5” SSD trays positioned on the PSU shroud. There are also two 2.5” steel trays behind the motherboard and two 3.5” drive cages below the shroud. This storage layout optimizes airflow and interior space for a clean-looking build. GAIN SUPERIOR CONTROL The H700i’s unique Smart Device includes features from the HUE+ and GRID+ V3 digital controllers, allowing for effortless control of RGB lighting and fans through CAM software. Customized lighting is streamlined with two integrated and individually addressable RGB LED strips. You don’t even need to waste time checking compatibility, installing, or manipulating physical buttons. The out-of-the box, elegantly controlled CAM software is all you need. 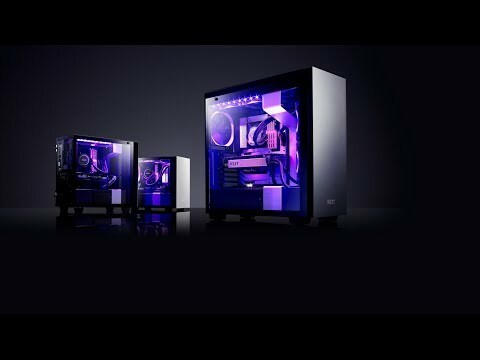 UP TO 40% NOISE REDUCTION Unique Adaptive Noise Reduction by NZXT uses an on-board noise sensor to measure and learn the specifics of your system to find the ideal balance between fan speed and cooling. With up to a 40% reduction in fan noise level, you won’t need to waste time designing custom fan curves. Leveraging machine learning to improve its results, this will ensure your fan settings are always optimal, even if you change hardware.